As I've said with other headphones I've tried quality is very hit-or-miss. A picture can make it look great and you have no reason to expect the sound to be bad. I'm glad to report that these are a great pair and I enjoy using them. Casual listener is how I'd classify myself and I can appreciate sound quality which leads me to say these are a good buy. There is a little room for improvement but I'd still recommend them to friends. Build- I don't know if I'd call the materials used "Premium" but I have nothing I'd necessarily change. 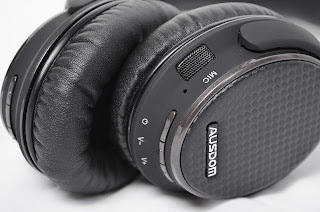 The ear cups are a nice pseudo-leather with plenty of foam behind to provide adequate comfort. I've worn them for several hours at work with no issues. Hard surfaces are a nice soft-touch plastic and the outside panel is covered by a tasteful textured vinyl that says classy without being gaudy. You have a real metal strip in the band which is always good to see and while there aren't mountains of foam on the top I didn't feel any unwanted pressure while using. Input wise you'll find the aux-in on the left along with volume and power. For the right side you get play/pause, seek, and the charge port. There's only so much innovation to be done about a dust cover on the charge port but it's current design almost protects too well. It took a little work to pop out so I'd like to see a little change by the manufacturer there if possible. Finally, the cups turn all the way perpendicular to the band allowing them to lay flat which is great for travel; even if you have to buy a case separately. Function- Compared to some recent wired headphones I tried I put these on with some hesitation but I have to say I love the sound. Highs are crisp and lows come through smooth and full. My only real complaint is that I don't think there is any insulation around the backs of the speakers. 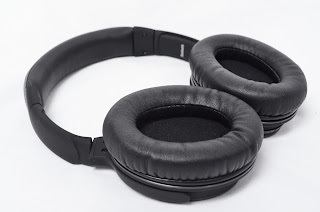 While these don't have an active-noise cancelling feature even the Quiet Comfort line from Bose only relies on that for the lows. Getting rid of those outside highs requires good insulation and I can hear everything right through them. If the maker here wants to have a solid 5-star product they need to work on this. I'd imagine it could be done with some fairly cheap foam so it wouldn't drive the price up at all if any. I'm not one for earbuds or the ones that hang off the ear so over the ear(not on-ear) Bluetooth is exactly what I've been looking for. 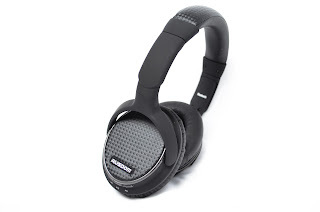 If you want to feel in the middle of your music without wires these are great. If you want to put them around your neck and blast them to make everyone else listen you should probably go over-pay for something flashy with a "b" on it. They should certainly be contenders for your dollar if they can be had for a good price. I received this product free in exchange for nothing more than my honest opinion.